In my previous three posts, 666: Calculating the Number of the Beast Part 1, Part 2, and Part 3, we learned that when king Solomon abandoned God he became a biblical type of the Antichrist. Continuing with the story of Solomon, we see the symbolism of the number 666 revealed in his life. At the beginning of his reign, God blessed Solomon with supernatural wisdom and everything he would need to rule Israel. However, later in his life Solomon turned from the Lord God and began to serve the god of this world. Through Solomon the backslidden king of Israel, the Bible unfolds the mystery of the enigmatic symbolism of 666, the number of the Beast. 2 Chronicles 9:13: Now the weight of gold that came to Solomon in one year was six hundred and threescore and six talents of gold. Solomon became unbelievably wealthy through heavy taxation, exploitation of natural resources, the liberal use of free labor, conscripted servants, and others subject to his authority (1 Kings 4:21; 5:13-18; 9:20-21; 10:21-23 ). Gold and other precious resources poured into Solomon’s coffers, and all of this in spite of the Law, which stated that the king was not to multiply horses, gold or silver, or wives. Solomon abandoned God for the world system, accumulating wealth and power in direct defiance of the Covenant Law and this led to his downfall (Deuteronomy:16-17). Furthermore, he sought to secure political alliances with nearby pagan monarchs by marrying their royal daughters. (Deut. 17: 18-20). Once Solomon sought to please his foreign wives more than God, he abandoned the God of Israel, and the ungodly rites of pagan idolatry filled the ensuing spiritual vacuum. His carnal example caused the people of Israel to backslide from the temple worship of Yahweh and they fell into licentious idol worship, including ritual child sacrifice. That situation lasted centuries, and had devastating long-term consequences for the nation of Israel (1 Kings 11:1-10). As the story of Solomon demonstrates, the Bible associates the number 666 with the wealth and power of the world system. The apostle John warns us not to love the antichrist world system. Indeed, according to John if we love the world, and all the things it offers, then the love of the Father is not in us (1 John 2:15). If you look at the verse in context, I believe it proves that loving the things of the world system will lead you away from God and into the open arms of Antichrist (1 John 2:18). Love not the world, neither the things that are in the world. If any man love the world, the love of the Father is not in him. For all that is in the world, the lust of the flesh, and the lust of the eyes, and the pride of life, is not of the Father, but is of the world. And the world passeth away, and the lust thereof: but he that doeth the will of God abideth for ever. Little children, it is the last time: and as ye have heard that antichrist shall come, even now are there many antichrists; whereby we know that it is the last time (1 John 2:15-18). Those who fully embrace the antichrist world system will, in the end, reject the God of heaven and naturally accept the doctrines of Antichrist, which naturally leads one into various forms of idol worship. How many of us have read stories in the news about famous people who claim they have made a “deal with the devil,” in order to gain wealth, fame, and power? I would not take these stories lightly because the Bible provides an example of this very thing—when Satan offered Jesus the kingdoms of the world. Again, the devil taketh him up into an exceeding high mountain, and sheweth him all the kingdoms of the world, and the glory of them; And saith unto him, All these things will I give thee, if thou wilt fall down and worship me. Then saith Jesus unto him, Get thee hence, Satan: for it is written, Thou shalt worship the Lord thy God, and him only shalt thou serve (Matthew 4: 8-10). Of course, Jesus rejected the offer but many famous men and women in New York and Hollywood enthusiastically embrace Satan’s proposition. He provides them many opportunities (and piles of money) to create endless hours of anti-Christian entertainment, which influences the masses to follow them down the Broadway, the Yellow Brick Road to hell (Matthew 7:13). In the past few years, WikiLeaks revealed that several high level political figures attend ritual ceremonies (a form of witchcraft) called “spirit cooking” dinners (if you can call it that), evidently to enhance their career though occult means. Politicians, lobbyists, and other interested parties gain power and wealth as long as they submit to witchcraft ceremonies and promote antichristian policies and destructive satanic laws for the United States and the nations of the world. Religious leaders love worldly accolades too; they are especially adept as they preach and teach the doctrines of devils, in turn leading billions of unsuspecting souls down the Broadway of destruction. Could that be why Jesus said, “For what is a man profited, if he shall gain the whole world, and lose his own soul? or what shall a man give in exchange for his soul (Matthew 16:26)? In the future kingdom of the Beast, we see 666 linked with gold and the economic prosperity of the satanic world system. Without the Mark of the Beast, a person cannot buy or sell, or hold a job. Rev. 13:16-17: And he causeth all, both small and great, rich and poor, free and bond, to receive a mark in their right hand, or in their foreheads: And that no man might buy or sell, save he that had the mark, or the name of the beast, or the number of his name. The number 666 closely linked with great wealth and economic control for everyone, the great and the small—meaning, the rich and powerful, the poor, the average blue-collar worker, and the busy executive. In order to work, or buy goods and services a person must yield their soul to the image and mark of the Beast. Just as Solomon abandoned God, so a person in Babylon the Great will eventually forsake God for the gold of the Beast (see Daniel chapter 4)—the mark of his name (666), and the image, which is an occult initiation. As I demonstrate in my book, Alien Antichrist, the image of the Beast is an occult initiation that leads to Beast worship. The image imprints the mind with a living image of the Beast (possibly as a luminescent being of light, a “spirit guide”), and the mark identifies a person as the property of both the Beast and the empire of Babylon the Great. 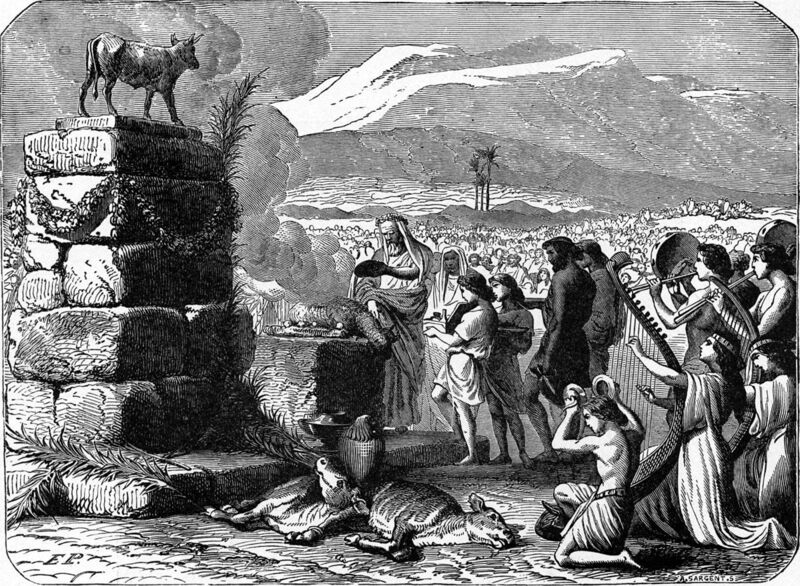 As in Solomon’s kingdom, ritual human sacrifice will be commonplace in Babylon the Great. Solomon’s idols were Ashtoreth, Milcom, Chemosh, demon gods that demanded worshippers to commit depraved immoral acts such as ceremonial immorality and ritual human sacrifice. According to Revelation 11: 7 “the beast that ascendeth out of the bottomless pit shall make war against them (Christians, the saints), and shall overcome (kill) them.” The Bible is explicit as it describes this dark time, when the cult of the Beast will rule the world and test the saints of God (Rev.13:10, 15). The apostle Peter must have had this in mind when he said, “Beloved, think it not strange concerning the fiery trial which is to try you, as though some strange thing happened unto you (1 Peter 4:12). The antichrist world system hates the Lord Jesus Christ and His saints (John 15:18). During this evil time the saints of God will overcome the Beast “by the blood of the Lamb, and by the word of their testimony;” and because they love the Lord Jesus Christ more than the antichrist world system they will “love not their lives unto death” (Rev. 12:11). Because of their deep commitment to the Word of God and the Lamb, their testimony for Christ will shine for eternity like a sparkling diamond. And I saw thrones, and they sat upon them, and judgment was given unto them: and I saw the souls of them that were beheaded for the witness of Jesus, and for the word of God, and which had not worshipped the beast, neither his image, neither had received his mark upon their foreheads, or in their hands; and they lived and reigned with Christ a thousand years. (Rev. 20: 4). Friends, do not allow the pre-Tribulation rapture to deceive you. Christians will be here to see the advent of the Antichrist Beast, and the last world empire, Babylon the Great. Read 2 Thessalonians 2:1-3, and you will see that before the gathering of the Church to Christ (the rapture), a great apostasy will appear leading to the revelation of the Man of Sin, the Antichrist Beast. I will have more to say about 666, the number of the Beast in my next post.